Point, click, shoot and ... floor plan? It was a final walk-through at a gorgeous estate in Los Feliz and there was no legacy floor plan. While we were struggling with tape measures, notebooks, rough estimates, and plenty of guesstimating, our client - who hails from Palo Alto and hence understands that thing called technology! - was quietly roaming around the house with his iPad. Fast forward to fifteen minutes later: We were still struggling with the living room measurements (Yards? Feet? Time for a Starbucks break?) when he came to us with an entire floor plan of the sprawling house. Of course we asked how he did it, and he gave us a tour of his MagicPlan app on his iPad. All the idiot-proof app asks of you is to point at the corners of rooms and doorways. It does the rest. 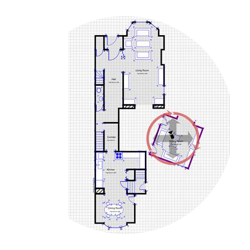 Based on your clicks, MagicPlan will measure the size of the room and draw a floor plan. It creates a DXF file, PDF document, JPEG images, and a website with an interactive floor plan if you so choose. The app works on recent-generation Apple devices (sorry Droid users, no luck) and it's as easy as one-two-click. Even better? The app is free for users who only need one or two floor plans. For professionals in the trade who may need more, there are various inexpensive subscription plans available. Free. You know what that means? Exactly. More money for your furniture budget.